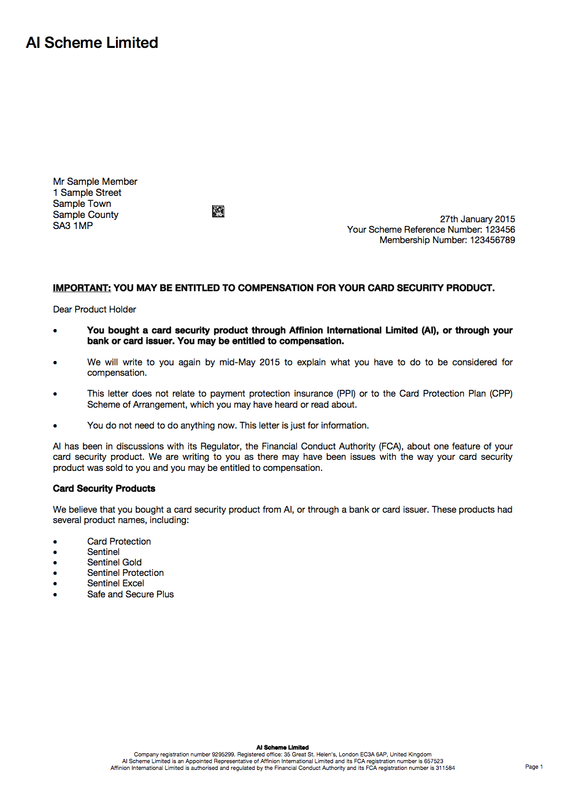 If you're one of the two million flogged worthless card protection by Affinion (often branded Sentinel), keep an eye on the post as the last of the letters informing customers about a redress scheme are due to be sent out – these aren't spam so don't throw them away. The problem here is that the 'card security' part of some of its products, which covered fraudulent use if a card was lost or stolen, was completely unnecessary as card issuers are typically responsible for fraudulent transactions. Many will have already received a letter outlining the 'AI scheme' set up by regulator Financial Conduct Authority to provide redress, but if you haven't, look out for one in the post after this weekend. The AI Scheme says the last letters will be posted on 23 February. If you don't get a letter by 2 March, call the AI Scheme on 0800 678 1930. You don't need to do anything when you get this first letter. It just explains that you may be entitled to redress. You'll then be sent another letter later this year to vote for the scheme, then another to claim for compensation, if all goes to plan. It's crucial to be aware that these aren't spam, or in any way related to PPI or other types of reclaiming. Some readers have already told us they may have wrongly binned their letter if they'd not seen our previous story and guide. As Paul tweeted: "Knew not to bin AI letter thanks to @MoneySavingExp. Could be in line for £160 compensation+interest #fingerscrossed." All letters sent will be branded the same, so familiarise yourself with them (see the example below), so you don't accidentally chuck them away thinking they're junk mail, as many did with the similar CPP redress scheme. If the scheme goes ahead – it first needs to be voted for by customers and then approved by the High Court – those mis-sold will get back every penny paid for this cover, which usually cost £25/year. You'll also get interest, which is calculated at 8% per year, but you do not get interest on the interest (ie, it's not compound interest). However, if you've made a claim, the value of any claim will be deducted from the redress. If your policy is still active and you decide to claim for redress, your policy will be cancelled.